According to sleep experts, the iPad's bright LCD display could be hampering your body's ability to create melatonin. Translation: Insomnia. The Kindle and other e-ink devices, on the other hand, won't disrupt your sleep cycle. The reason for this is the bright light cast into your media-consuming eyes. 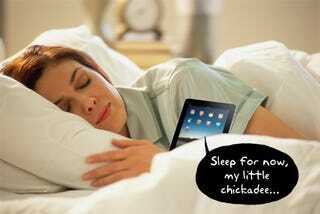 With the iPad, the LCD display confuses your body, hampers melatonin, and causes sleeplessness. The Kindle, as we all know, has no back light and the impact on your Circadian Rhythm is non-existent. "The take-home lesson is that insomnia and electronics gadgets emitting light should not [be] mixed before bedtime," UCLA Neurology Clinic Director Alon Avidan, also an associate professor at the university, wrote in an e-mail to the Los Angeles Times. However, "Kindle is better for your sleep."